Popular breakfast spot, crowded on weekends, serving eggs, pancakes, and other standards. 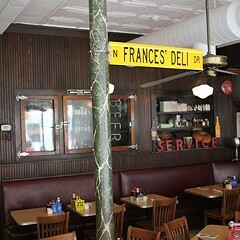 Located a few blocks north of its original location, Frances' qualifies as a deli in the sense that it offers corned beef, pastrami, and a few other traditional delicatessen mainstays, but it trades more heavily in omelets and a range of meat-and-cheese sandwiches and burgers--a very good trade, indeed; as the place is frequently very busy, the locals eat this stuff up. You won’t find hard-core Ashkenazi faves like kishke and gefilte fish here, but we savored fried matzo, simple and satisfying though overpriced: $5.50 for the basic platter is boosted with preposterous upcharges of $1.75 for onions and $2.75 for salami. Corned beef tends to be leaner and less full-flavored than pastrami, which is ribboned with luscious fat. We were let down by the dry, overfried potato pancakes, as well as the tough, overgriddled blintzes. To drink, grab a can of Dr. Brown’s, a soda closely associated with the New York deli, though alas Frances' doesn't carry Cel-Ray, the refreshing, celery-based flavor of this almost 150-year-old brand. You can, however, get wine, beer, or a mimosa with your matzo ball soup.